Born in 1946 in London at the end of the Second World War, Michael Rosen is most well-known for his large collection of children’s stories and poems. His father was a secondary school teacher and professor of English and his mother worked both as lecturer and for the BBC. Indeed, some of Rosen’s earliest work was broadcast on a series she was producing at the time. Educated at Watford Grammar School, he initially wanted to be a doctor, inspired by the work of Johnathon Miller, but soon found it wasn’t for him. Subsequently he went on to study English at Oxford University. He graduated in 1969 and became a trainee with the BBC and was involved with children’s television, working on school programmes and writing scripts, before getting on the wrong side of the corporation’s vetting procedure. He was asked to leave in 1972. The reason was his left-wing political views which were not seen as compatible with the BBC’s corporate identity at the time. He would return to the BBC later in life as a successful broadcaster and TV presenter. He published his first collection of children’s poetry in 1974, Mind Your Own Business, which was marked by its humorous verse, something that still runs through his poetry today. Other collections followed, drawing largely on his own childhood experiences. Whilst he never really thought of his verse as specifically appealing to children, the more successful it became, the more it opened a whole new world of poetry for the younger generation. He began to visit schools to do readings and continues to do so today, not only in the UK but across the globe in Asia and North America. In 1993 Rosen received an MA in Children’s Literature and went on to take a PhD. He has been married three times and has five children and two stepchildren. In 1999, his son, Eddie, died of meningitis and that experience led him to write Michael Rosen’s Sad Book in 2004 which received an award from the English Association. The book explores his feelings of grief and was written, according to Rosen, ‘in a moment of extreme feeling’. As with most of his books it was illustrated by artist Quentin Blake who added a vital dimension to Rosen’s sparse and heart breaking prose. Rosen has spent his life campaigning on educational issues but has also been vocal about the Palestinian cause, all the more remarkable considering his Jewish ancestry. A socialist at heart, he has stood in parliamentary elections and is a staunch Republican. In 2007 he was made the fifth Children’s Laureate in Britain, an honor which is awarded for two years to a writer or illustrator who has made an outstanding contribution to children’s literature. His poetry is characterized by its ability to speak in a quirky, humorous way that has delighted children for the last 40 years. 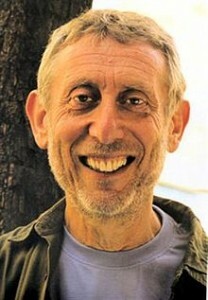 Michael Rosen has more recently worked as a TV and radio presenter with the BBC and has taken up as position as professor at the University of London helping to develop courses in children’s literature.